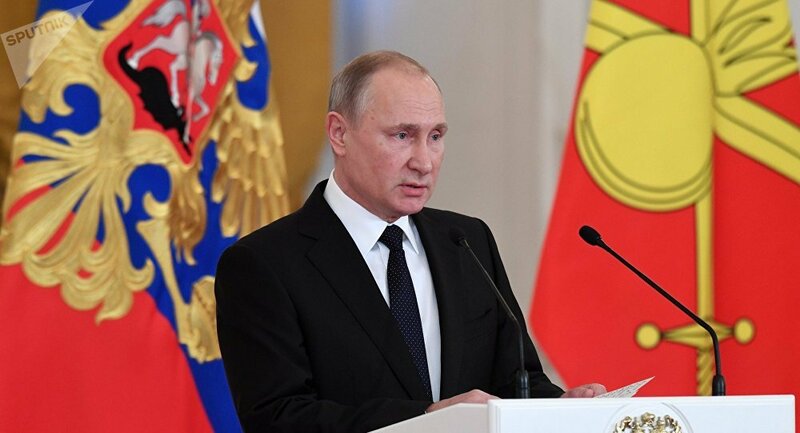 Putin has reminded that the Russian Federal Security Service (FSB) had recently foiled another terrorist attack in the city, referring to the detention of a cell that planned to target public places, including the Kazan Cathedral. Russian President Vladimir Putin has declared the explosion in St. Petersburg a "terrorist attack," ordering to act in accordance with law when detaining those responsible for the crime. The president said that if there is a threat to the lives of law enforcement officers, they need to "act decisively, not to capture anyone, to kill on the spot." An explosion occurred on Wednesday at a grocery store in Putin's home city of St. Petersburg, leaving at least 13 injured. According to the Russian Investigative Committee, preliminary data shows that a device stuffed with damage agents is likely to be the cause for the explosion. While the investigation is underway, all versions are being considered. — Пятый канал Новости (@5tv) 27 декабря 2017 г.
Putin has reminded that the Russian Federal Security Service (FSB) had recently averted another terrorist attack in the city. Earlier in December, Putin held a phone coversation with his US counterpart Donald Trump to express gratitude after the Central Intelligence Agency (CIA) provided intelligence data that terrorists were preparing attacks in St. Petersburg. The Kremlin has described the help in foiling the attack as an "exemplary model of the bilateral cooperation in the fight against terrorism." The Russian Federal Security Service (FSB) detained a cell of Daesh supporters in a special operation on December 13-14 that had been planning to commit "high-profile attacks" in St. Petersburg, including targeting the Kazan Cathedral, aiming to kill people by detonating explosive devices in crowded places, adding that "a significant amount of explosives, components of improvised explosive devices, automatic weapons, ammunition, extremist literature were seized from them.